Redfin recently released its list of the most competitive neighborhoods in 2015, with a majority of them concentrated in Boston, Seattle and San Francisco. Based on the percentage of homes that sold in the neighborhoods above asking price, the days on market until homes went under contract and the percentage of homes that saw a bidding war, Redfin found the most competitive housing market in the nation to be Inman Square in Cambridge, Boston. American University Park was ranked as the most competitive housing market in Washington, D.C., with 86 percent of Redfin homes going through bidding wars. 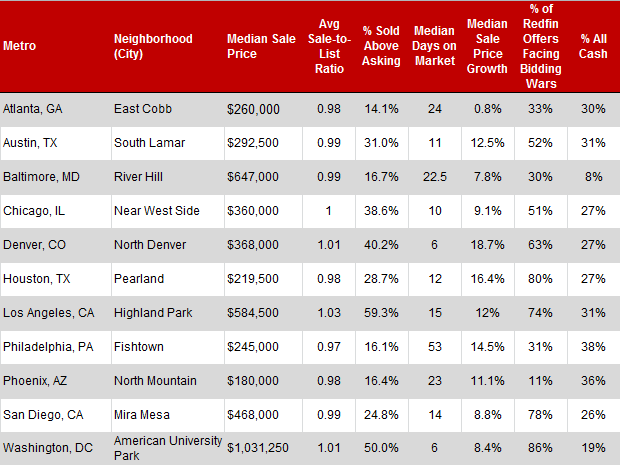 The median sales price was $1,031,250, which increased 8.4 percent over last year. In total, Redfin measured seven factors of single-family homes, townhomes and condos in “controlled neighborhoods.” Annual median sales price growth, percentage of cash sales and average number of competing offers were a few of the other factors considered.